China’s last national defense white paper – the most authoritative document on its defense and security policy – caused quite a stir when it was released two years ago. Some foreign analysts were concerned that China was changing its long-standing policy of No-First-Use (NFU) of nuclear weapons because this policy was not mentioned in the document. Chinese experts quickly pointed out that the absence of NFU pledge from that white paper did not imply a weakened Chinese commitment to NFU. They argued that, starting in 2013, China changed the format of its defense white papers from a comprehensive format to a thematic approach which focuses on a specific topic. The 2013 paper focused on “The Diversified Employment of China’s Armed Forces” and therefore was not designed to thoroughly delineate China’s nuclear policy. This explanation seems to be confirmed now as the newest 2015 white paper – which was released on May 26, 2015 – again uses the thematic format and focuses on “China’s Military Strategy,” instead of offering a comprehensive review of every aspect of China’s defense policy. But, having learned lessons from last time, China made sure to include its NFU commitment in this year’s document. China also reaffirms in this white paper that its nuclear weapons are only for two purposes – “strategic deterrence and nuclear counterattack.” It essentially removes any doubt that China might use nuclear weapons in conventional scenarios. This should put the debate about whether China has changed its NFU policy to an end. That said, the most important part about China’s nuclear posture in this white paper is not the reaffirmation of NFU policy, but its mentioning for the first time that China seeks to “improve strategic early warning” for its nuclear forces. For about a decade, there has been speculation about whether China is going to build a strategic early warning capability for its nuclear forces. So the question is: What does China mean by this capability? One possible reading is that China wants to build a strategic missile early warning system similar to those of the United States and Russia. The United States maintains a network of satellites and land-based radars that can detect and track the launch of an enemy long-range missile heading towards its territory. This capability makes it possible to respond quickly. For instance, it can choose to retaliate by launching its own nuclear missiles before they are destroyed by the enemy attack – a posture that is called “launching on warning.” It can also choose to use its missile defense systems to intercept enemy missiles before they land. The Soviet Union during the Cold War also built an extensive network of early warning satellites and radars. But after the country dissolved in 1991, Russia had only limited funds to maintain the systems. It no longer runs any early warning satellites and currently only relies on a small number of land-based radars for a limited early warning capability. In recent years, however, Russia has indicated an interest in revitalizing both its space-based and land-based early warning capabilities. In a number of cases, China has demonstrated its willingness to follow the examples of the two major nuclear powers in modernizing its own nuclear forces. The most recent examples include its development and deployment of MIRV (multiple independently targetable reentry vehicle) technology and a sea-based nuclear deterrent capability. So it would not be a total surprise if China is considering obtaining its own early warning capability, which has been possessed by the United States and Russia for decades. Since 2004, China started to talk about improving the “rapid response” capability of its nuclear forces in defense white papers. At that time, it was not very clear what China meant by rapid response. It could refer to a policy to rapidly launch a retaliatory strike after absorbing a first strike. China is believed to have a policy of launching retaliation only days or even one week after being struck. This is very different from the U.S. and Russian practices of immediate retaliation, so China might be interested in changing that and shortening the retaliation time. A more aggressive reading of the “rapid response” statement is that China wants to have a strategic missile early warning system and seeks to launch nuclear missiles immediately if an incoming first strike from an enemy is detected. This practice is called launch-on-warning. And the question is: Will China move to a launch-on-warning posture? Launch-on-warning means China can increase the survivability of its nuclear weapons by launching them before they are hit. This will increase the credibility of China’ nuclear deterrent – something China is concerned about given increasing American missile defense and conventional precision strike capabilities. However, launch-on-warning also introduces a great degree of risk. If the early warning system is not 100 percent error-proof, a false alarm could lead to an unintended nuclear war. In addition, to take advantage of a launch-on-warning capability, a country’s top leadership would be forced to decide quickly whether to launch their own nuclear weapons if they believe an enemy strike is likely underway. An intercontinental ballistic missile would only take about 20-30 minutes to reach China from the United States; a submarine-launched ballistic missile could arrive even more quickly. Given the extra time required to execute a launch order, the top leadership would have about 15 minutes at most to make a decision. Given the extremely high stakes of such a decision and the extremely tight time pressure, no national leader should want to put themselves in such a position, and no one can guarantee that wrong decisions won’t be made under such high-pressure circumstances. Moreover, launch-on-warning might complicate China’s unconditional NFU policy. 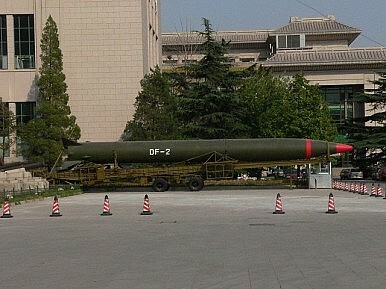 For instance, if China detects an incoming missile strike but cannot be 100 percent sure whether the incoming missiles are armed with nuclear or conventional warheads or whether China’s nuclear weapons – instead of other military assets located next to the nuclear missiles – are the actual targets of the incoming strike, should China launch its nuclear missiles despite these uncertainties? In addition, China is believed to have maintained a very low alert level for its nuclear weapons during peacetime – its nuclear warheads and missiles are said to be separately stored. This is seen as contributing to stability and global nuclear arms control. However, if China adopts launch-on-warning, it may keep the warheads mated with missiles and keep the weapons at a much higher alert level. This could increase the risk of accidental or unauthorized launches. Therefore, China should be very cautious about embracing a launch-on-warning posture. At least it could refrain from adopting launch-on-warning during peacetime and only do so when a serious crisis emerges. There are also measures China can take to increase its nuclear survivability without adopting launch-on-warning. For example, after detecting an enemy strike, China could order an emergency mobilization for its road-mobile missiles, or, if possible, immediately send some of its missiles into deeply buried underground facilities. On the other hand, it is also possible that China’s interest in strategic early warning is driven by its interest in obtaining some missile defense capability rather than by a desire to shift to a launch-on-warning posture. China has conducted a few missile defense tests and will likely seek to deploy such technologies in the future. An early warning system is necessary for the development and deployment of missile defense, and writings by many Chinese strategic and technical experts attest to their interest in building an early warning capability for China’s future missile defense system. There is yet another possibility: that the “strategic early warning” in the white paper actually refers to strategic warning in a general sense, i.e., strategic warning based on assessments of an enemy’s military mobilization and war preparation activities. That makes sense because military tensions take time to build up – an “out of the blue” surprise strike during peacetime is very unlikely. If this is what China refers to in the white paper, it means China has yet to formally commit to a full-blown program of building space- and land-based early warning systems. In any case, many analysts in China seem to support the idea that China should have some early warning capabilities, although the exact nature, size, scale, and purpose of such early warning capabilities have not been thoroughly examined. China seems – quite sensibly – to be developing this capability in a gradualist manner – starting from short-range detection systems and, if that goes well, perhaps gradually moving to the development of long-range strategic early warning capabilities. So ultimately China will face the question of what kind of strategic early warning capability it needs for its nuclear forces; and if it decides to develop a full strategic early warning system, whether it serves China’s interests to shift to a launch-on-warning posture. It will require good strategic planning to make the right decision on these very important security issues. Tong Zhao is an associate in Carnegie’s Nuclear Policy Program based at the Carnegie–Tsinghua Center for Global Policy in Beijing. He was previously a Stanton Nuclear Security Fellow with the Managing the Atom Project and the International Security Program at the Belfer Center for Science and International Affairs at Harvard University. Acknowledging that MAD is once again at play will make U.S. nuclear deterrence more realistic.